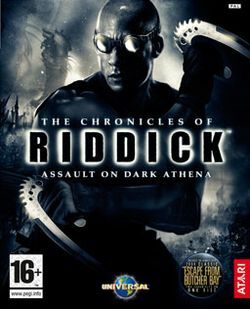 The Chronicles of Riddick: Assault on Dark Athena is the second video-game installment in The Chronicles of Riddick. It follows the story of Riddick after his escape in a small vessel, only to be picked up by a group of bounty hunters on Dark Athena. Copies of Dark Athena also includes a remake The Chronicles of Riddick: Escape from Butcher Bay, with minor changed made to the gameplay. This page was last edited on 30 May 2016, at 14:28.